Would you pay a minimum price of £5 to support a Kickstarter project - Hero: The Realm? I don't have a compatible machine. 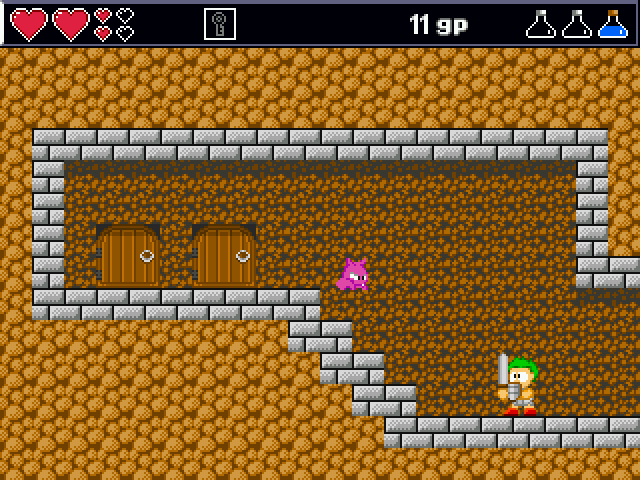 Hero: The Realm is a hack n slash adventure game I developed for Windows in 2012. It features intriguing puzzles and many levels with original pixel art graphics and my own created sound FX & music. Sadly I had to halt development half-way due to financial/life issues. It would be great to have the opportunity to create the "full potential" game with Kickstarter funded support. Timescale is possibly 6 months - though a full recode and design is in order. I have the graphics and sound assets on standby. I mean to redesign the levels from the "halfway house" prototype version on Windows PC. Also, I've created a decent port for Nintendo Wii and a lesser known handheld, the GP2X Caanoo. This game will be available for all 32-bit Acorn machines. To be programmed from scratch in C on RISC OS, Hero: The Realm will be able to run far more "optimised". I'll take in the poll results and please do comment underneath! Last edited by Square Mezzmer on Sat Mar 17, 2018 3:23 pm, edited 8 times in total. Sorry what do you mean by "Digital locked copy" I presume this would be a disk image for emulator use? Are you intending to DRM this in some way? @z0m8ied0g Yes, the digital copy would have a special type of DRM alike Spheres Of Chaos recent port. The method hasn't been decided yet, though more than likely it will involve user's Kickstarter email address. I see the poll currently has just more "non-interested" than commited replies. Why would this be? Please comment. I'm glad people like the idea of the physical copy! It will come with a nicely designed printed label for each copy, we know some expert creative media printers to do the job. I voted not interested because I have no RISC PC here, only BBC B and other 8-Bit machines. A graphics/software developer of ARM has contacted me. He'll be coding in on the project and also I am now planning to develop the game for Archie. This practically will cover all the Acorn 32-bit machines. Ports could also be made to Raspberry Pi and possibly even more platforms. So great news all round! Also, if you don't have a compatible machine - it's better for my results that you don't vote that you are "Not Interested..." in the POLL. This is after all a 32-bit forum section. Anyway have fun and please comment or ask questions. EDIT: Apologies for the last paragraph. I wasn't attempting to take away rights to vote in a POLL. I did not mean to cause offence - in retrospect I shouldn't have mentioned it. Last edited by Square Mezzmer on Wed Mar 07, 2018 8:40 am, edited 2 times in total. Square Mezzmer wrote: Also, if you don't have a compatible machine - it's better for my results that you don't vote that you are "Not Interested..." in the POLL. This is after all a 32-bit forum section? Anyway have fun and please comment or ask questions. Well, pardon me for breathing ... I shall of course, vacate this thread in the 32-bit section forthwith and not return until such a day arrives when I satisfy your entry requirements. @topcat96 I'll start by saying I'm very sorry if you feel offended by my last post. I hope you understand I meant you can vote, though it's better for my POLL if viable results come in. In retrospect now I think I should not have mentioned it. I'm not being picky just to wind you up, but maybe can you re-word it, please? You said: Also, if you don't have a compatible machine - it's better for my results that you don't vote that you are "Not Interested..." in the POLL. Which is (it seems to me) what topcat96 did - he's got 8-bit machines, not compatible with what you are doing, so he voted "Not Interested". Or do you mean if the prospective voter has got a 32-bit machine that's not compatible with your intended 32-bit platforms? @richardtoohey The POLL isn't really intended for 8-bit users. If I wanted better data I should have made this clear to start with, perhaps I can modify the POLL with "I don't have a compatible machine" as a possible selection. Sorry again that offence was caused, that was my last intention! People on here are 99.99% very friendly and wanting to be helpful and supportive, especially of new projects that breathe new life into our retro computers (or not so retro in the case of the Pi). It's a great forum. So if you are clear on what you are after, I'm sure you'll get a decent response. Square Mezzmer wrote: A graphics/software developer of ARM has contacted me. He'll be coding in on the project and also I am now planning to develop the game for Archie. I'd suggest coding for ARM2 thru ARMv7 machines from day one, instead of coding specifically for RiscPC or A-series, or at least factor it into your design decisions. Beyond RiscPC for example you want to avoid self-modifying code, use triple buffering, no hardware scrolling and use a 16M colour screen mode. Personally I don't think Kickstarter should play any part in Acorn development, so I won't vote to avoid skewing your results. You've certainly got balls, I'll give you that! Square Mezzmer wrote: @z0m8ied0g Yes, the digital copy would have a special type of DRM alike Spheres Of Chaos recent port. I'd rather not have DRM on it, if you do then it needs to be transparent so that you don't require key disks to start it from the hard disk. I'm not really sure that its that beneficial these days. The market place is that small that a lot of people will buy one just to support your efforts. Square Mezzmer wrote: Timescale is possibly 9-12 months - though a full recode and design is in order - for RISC PC. This practically will cover all the Acorn 32-bit machines. Also, if you don't have a compatible machine - it's better for my results that you don't vote that you are "Not Interested..." in the POLL. This is after all a 32-bit forum section. The sad truth is that most games are mediocre and not worth playing. There needs to be some good reason to bother trying a game, even for free. You are an unknown who joined the forums a week ago. There's no particular evidence you can write and publish a video game, and you've not mentioned anything distinctive and interesting about what you're intending to write. If anything, you are coming across as more interested in making money than in making a good game. You should take a look at Sarah Walker's process: openly talking about what she's up to, releasing previews, discussing techniques for pushing hardware to the limits. Then, when the game is released, offering it as a free download but selling physical copies in good quality retro packaging. That means at least £3000 needs to come from somewhere before the project can go from outsized working prototype to final product in people's hands. There are other options, but Kickstarter is one of the things I'd considered, partly because the more advance orders there are, the cheaper it gets for everyone. I think that's an appropriate use for Kickstarter, but I'm genuinely interested in finding out sooner rather than later if people have an ideological problem with it. I love the idea and the GFX. Replace 'for the RISC PC' by 'for RISC OS', and it's OK for me, as a user of RISC OS 5 on Raspberry Pi. And no DRM of course: it's no use. So, you've set yourself a very difficult task with this poll. The reason I say this is because, though I voted not interested, it's not entirely true. I have an A3010 and am unsure if you will consider that as one of the machines your program will run on and I see no purpose for DRM. This community supports programmers and programming for our retro beasts very well, even if it's a fairly small community. My interest in this is IF it would work on my A3010 and IF it wasn't DRM then 5 pounds is not too much to support your programming effort for a downloaded copy. I live in Canada so find DRM is not necessary at all. It's very difficult to configure a poll to everyone's preferences. Square Mezzmer wrote: The POLL isn't really intended for 8-bit users. Money is not really my main interest here! However I want to redevelop a game which has been a labour of love for many previous years, but I'm 38 now with little finances and wanted to work more or less full time crowdfunded to get an Acorn 32-bit game finished, with physical copies which will also need funding. I didn't think I'd need to prove a resume to engage successfully with the community. If you check my signature there is a link showing a written and published game "Sheepdog Adventure" for Android phone. Maybe you missed that! crj wrote: You should take a look at Sarah Walker's process: openly talking about what she's up to, releasing previews, discussing techniques for pushing hardware to the limits. Then, when the game is released, offering it as a free download but selling physical copies in good quality retro packaging. Thanks for the hint. Also, I have planned to create vintage style professional disk labels via a printers in Shoreditch I know personally that specialise in physical creative media. But again I can't make all that for free. Are sd-cards a good format do you think? I could do that same for them, plus Raspberry Pi users just might be interested. Lastly, I loved my Acorn machines since and early age when my father brought an Acorn Electron home. I had an A3010 and then a RISC PC 600. In some ways unfortunate I moved to Windows PC around 2000 and I feel my work isn't done with ARM machines. I didn't think I'd have to "prove my worth" quite so much - through quite a few negative comments in this thread. The game will be vastly improved with more ingenious levels and much enhanced! KarateEd wrote: So, you've set yourself a very difficult task with this poll. I've thus updated the top message in the thread. Yes your machine is now a target platform for the game! Thanks for the good luck wishes. @DaveH cheers for your kind words and all who are encouraging me. Definitely, they're like trophies . . .
Square Mezzmer wrote: Money is not really my main interest here! However I want to redevelop a game which has been a labour of love for many previous years, but I'm 38 now with little finances and wanted to work more or less full time crowdfunded to get an Acorn 32-bit game finished, with physical copies which will also need funding. I think your main problem is that you've grossly over-estimated the size of the RISC OS market. Minimum wage is currently £7.50/hour. 9 months work is about 38 weeks, or 1330 hours for a 35 hour week. That's £9975. At £5 a pop, you'd need to sell 1995 copies. Admittedly I don't really know how many active RISC OS users there are, but I'd be surprised if you were able to get those kinds of sales figures. Even at a higher price point (e.g. for the physical version), you'll struggle to raise the amount of money you're asking for. For several years the ROOL bounty program has been running in order to try and raise money for some much-needed work to be performed on various areas of the OS. For the big bounties it typically takes a year or more for the funding to reach a level high enough for someone to try and claim the bounty - e.g. stage 2 of the filing systems bounty has been open for over three years now, despite everyone being in agreement that partition support is something which the OS needs. I have however thought this through. If it must be known after all - these are the full crowdfunding rewards: I am charging £5 as a support fee for each download. A disk copy or sdcard copy will cost £10/12 decorated with a specially printed Hero: The Realm artistic label posted to the crowdfunder's home address. There is a larger market (also to Raspberry Pi owners) I hope to raise around £5000 as a target. If this is exceeded it would be wonderful. I don't really see what minimum wage has to do with this exactly. Hopefully we will finish in 6 months or less now I have another coder to help with programming tasks. You say it's a Labour of love and will be porting it and it's not about the money. If I were you, and I'm no expert, I would get a quick prototype up and running to demo the main mechanics and put it out there to see what the interest is like. Then if the interest is good complete it. Try the other RISC OS forums too to maximise the coverage you receive. In my opinion RISC OS needs more games but it is going to be a tough nut to crack. Square Mezzmer wrote: I don't really see what minimum wage has to do with this exactly. It's a useful benchmark for how much money you need to make out of some enterprise in order for it to be a better source of income than literally any job one could accept. If you're going to get less, then what you're doing isn't a job, it's a labour of love. Now, there's nothing wrong with labours of love. The retrocomputing world is full of them. For most of us, this is a hobby, and hobbies don't have to break even. But if you care more about bringing something into existence than earning a living wage while doing so, you need to be clear that's your priority. I understood what you wrote. I mean my personal finances on this project is not the concurrent issue. The game and Kickstarter is. I'm a bit sad because this thread has been picked apart by the negative commentary and I've had to reveal a lot about the project when I wanted to deal with this in a professional manner. Thanks for those that advised about DRM being a negative thing, I therefore will not be using a DRM system - though as the potential supporters will be crowdfunding the game they will get definite priority. I said the prototype that was developed before 2012 was, please do not misquote me. I require funding (which doesn't even arrive until the Kickstarter reaches it's target) for the disks, sdcards and printing costs. I would like also a fund to use in future or to secure my finances and help me in my endeavour to set up a small games label... phew. As you have said, it possibly is a labour of love? In colloquial terms, yes, but that's not the real issue. Thanks. Especially to those that commented positively and supported me. Last edited by Square Mezzmer on Thu Mar 08, 2018 6:13 pm, edited 1 time in total.